Join the discussion on our forums! 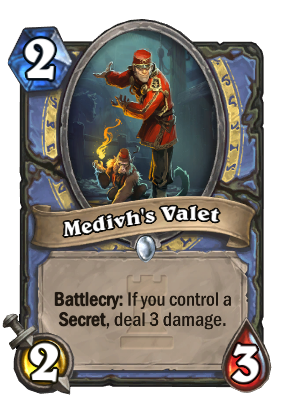 Come discuss Medivh's Valet over in our dedicated Medivh's Valet discussion topic. Should cost 3 mana or deal 2 damage instead. The best play quote in the game. "No, no. The monkey is quite educated. It's not it that you should be worried about. Haven't you heard? They say valets, these days, are full of secrets." I like this card. Gave me Chillmaw, Deathwing and Ysera . Glad they came late in the game. Works well with my Reno Mage. Why am I able to craft it right now as it is only week 3 and not week 4.
have you actually tried to craft the card? "we're sorry this card cannot be crafted or disenchanted at this time, please contact blizzard customer support." it looks like it uses the dust but then you get the dust right back and no cards are created. "Let me show you the door". My guess at what the entrance quote will be. Oh, dude, sorry, I thought that was gachimuchi reference. Memes everywhere. sadly the card is bad in standard because its way to offcurve to be playable in an aggro meta. but i like my dub/echo mage with the new owl and now this card. its so sad that there is only one way to build mage atm in standard, control mage/infinite fireball mage was just the most fun deck ever.